"PLEASE READ THIS! MY LIFE DEPENDS ON IT! But don’t take my word for it, read the book and decide for yourself. You’ll laugh, you’ll cry, you’ll scream in frustration. Or maybe that’s just me. After all, it’s my life." And now, it's on to the giveaway. One lucky winner will receive a copy of My Life Undecided. To enter, please fill out the form below and leave a comment letting everyone know whether or not you'd let other people make your decisions for you. An extra entry will be given to those who watch the book trailer. This giveaway is open to US and CA participants only and will be open till October 15th. After that, the winner will be contacted for their mailing information. If the winner does not reply back within 24 hours, another winner will be chosen. Good luck, everyone! And special thanks to Tara and Macmillan for allowing me to host this giveaway! ummm...heck no?! I would never let anyone make decisions for me, no matter how horrible I was at making them! Definitely not. I couldn't handle my decisions being in someone else's hands. No way would I let another make my decisions for me! That is how we live and learn by trial and error. I have been my whole life and I think I should change it up a bit....you know, throw them for a loop. Thanks for the great giveaway. Definitely not! I like to make my own decisions based on my own thoughts and ideas. I'd never let anyone make my decisions for me. If I was 15 like Brooklyn, then perhaps I would like to see what others would do in my situation. However, I would decided for myself whether or not to carry out those decisions. I think I got a copy of this one at ALA. It looks cute!! I would hate that. There is just no way, it would drive me insane. Never, never ever!! I love making my own decisions, even if my decisions are bad ones, because in that case, I can learn from my experience. Yikes, people making decisions for me reminds me of the dystopian novels I read, and while I like reading them, I'd never actually want to live in that kind of society. wow thanks so much for the awesome giveaway! i really love your blog and have been following it for months now!! I dont think I could have just anyone making decisions for me. Maybe if I trusted someone completely I could, but not just anyone. 1) I would totally let other people make decisions for me. Not about love, but everything else, for sure. I'm sooooo bad at making decisions. It pretty sad, actually. and the trailer is awesome. If it was a really hard choice I might ask for oppinions but I know I ultimitaly need to make my own decisions! I would not let others make decisions for me! No. I make my own decisions. No, I would probably not let others make decisions for me. 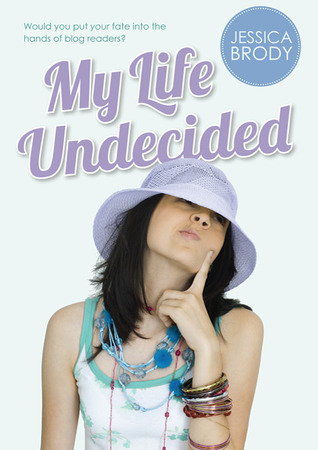 MY LIFE UNDECIDED is a fun, fast-paced read that feels like you're watching a movie (and hopefully one day you will be)! This is contemporary YA at its best.